THE GOOD This four-door French door model doesn&apos;t have any glaring weak spots, and also sports one of the best adjustable-temp drawers we&apos;ve ever tested. THE BAD Performance was just OK, with temperatures consistently running a few degrees warmer than the target in our tests. The ice maker also blocks off one of the in-door shelves. THE BOTTOM LINE This is a well-rounded and decent-looking fridge that you might be able to find at a discount as newer models start rolling in. For $3,300, Samsung sells a "Food Showcase" French door fridge with a hidden door that lets you access the in-door shelves. The problem? 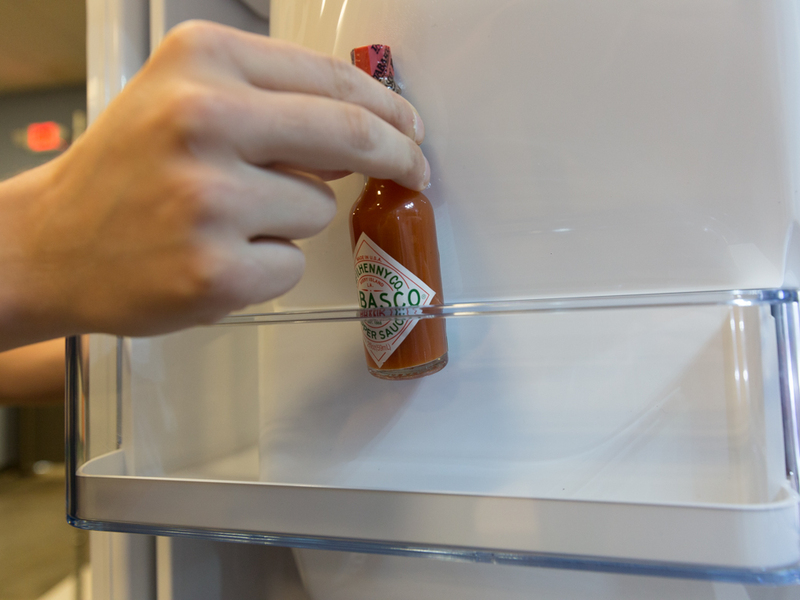 Not all of us are sold on the utility of putting a door in our refrigerator door. Enter the Samsung RF28HMEDBSR. For that same $3,300 asking price, it&apos;s a nearly identical model that ditches the Food Showcase feature and replaces it with a dedicated "Flex Zone" drawer that you can dial up and down between four temperature presets. For my money, that&apos;s the more practical feature of the two, and also the feature that&apos;s more worthy of a high-end asking price. Think about it -- one is an entire additional section for refrigerated goods, complete with its own thermostat. The other is a latch. My main problem with this fridge is that it wasn&apos;t a strong performer in our battery of tests. Most sections of the interior ran a few degrees warm at both the default, 37-degree setting and at the minimum setting of 34 degrees (though, in fairness, that Flex Zone drawer was a performance standout, with accurate, steady temperatures at both its highest and lowest settings). Overall, we saw better cooling performance from the comparable LG LMXS30786S, which retails for $3,600. Still, the RF28HMEDBSR is over a year old at this point, and with retailers making room for 2016 models, you might be able to score it on sale. As of now, the average price is down around $2,600 -- if it falls any lower than that, I&apos;d say it&apos;s worth considering. 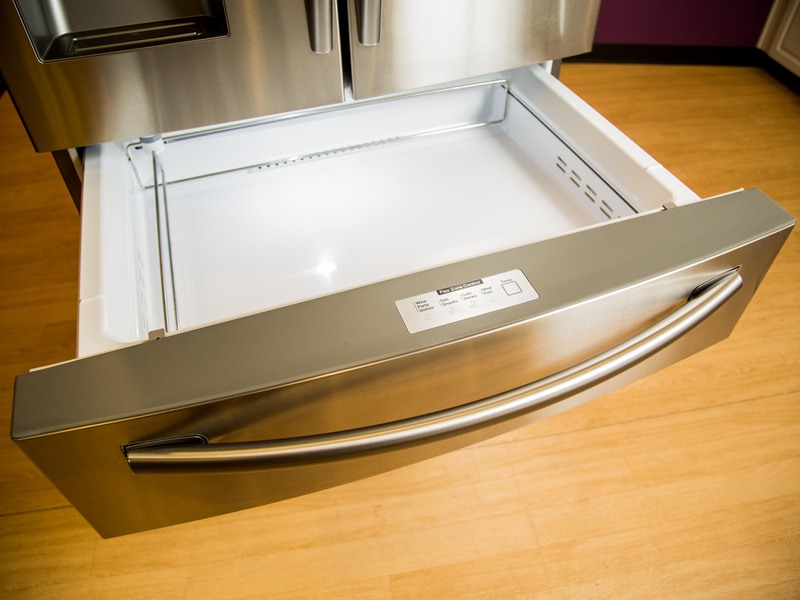 The Flex Zone Drawer is this fridge&apos;s best feature. 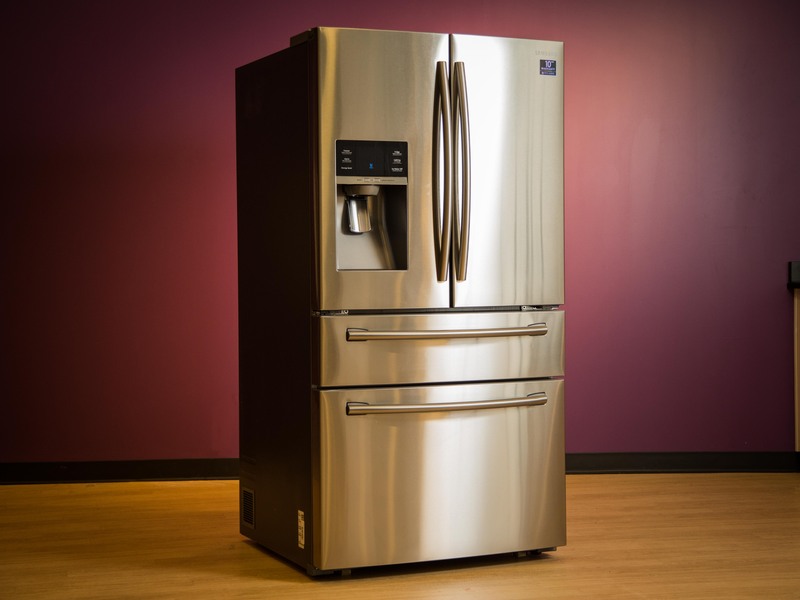 It doesn&apos;t come in black stainless steel like Samsung&apos;s newer high-end fridges, but the RF28HMEDBSR is still good-looking, thanks in large part to the four-door design that you get with a dedicated flex drawer. Still, it isn&apos;t a unique look -- the very well-reviewed LG LMXS30786S has the same basic build, though it also costs a few hundred dollars more. The interior is essentially the same as the Food Showcase version, save for the addition of that flex drawer. You might think that the flex drawer would eat up some of the main refrigerator section&apos;s storage space, but it doesn&apos;t really -- the Food Showcase model had a pantry drawer beneath the crispers, and in this model, the flex drawer simply takes its place. Of the two, I&apos;ll take the flex drawer. It&apos;s roomier, for starters, and it also has more temperature presets and a more robust thermostat than the pantry drawer did. Plus, as mentioned before, it looks good. 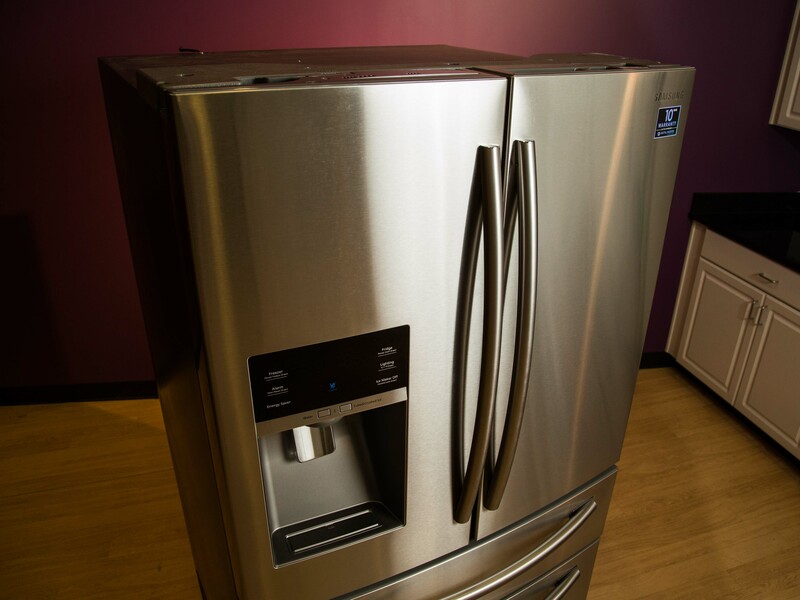 Like in similar Samsung models, the bulky ice maker blocks off one of the in-door shelves. The similar interior build yielded storage test results that were nearly identical, which is to say that the RF28HMEDBSR has plenty of space for your family&apos;s groceries. You might need to move a shelf or two in order to make room for big, bulky items, and those shelves aren&apos;t as easy to move as I&apos;d like, but you at least get a shelf that slides out and another that flips up out of the way, same as the Food Showcase model. The RF28HMEDBSR consistently ran a few degrees warm in our performance tests. Still, there wasn&apos;t anything that alarmed me. The body of the fridge never quite averaged above the FDA&apos;s food safety benchmark of 40 F, good enough for a passing grade in our test lab. All in all, the comparable LG LMXS30786S was the stronger performer overall, but I do give Samsung&apos;s drawer an edge. With drawers like these that have their own temperature settings, we&apos;ll set them to the opposite setting of the fridge -- as cold as it&apos;ll go during the default temperature test, then as warm as possible when we test the fridge at its coldest setting. In both tests, Samsung&apos;s Flex Zone Drawer was right on the money, and by far the most accurate section of the entire appliance. Whether you&apos;re using it to store delicate items like meat, fish, and cheese at the optimal temperature, or you&apos;re just looking for a fridge with a beer drawer, it&apos;ll do the job nicely. This isn&apos;t the most impressive fridge I&apos;ve ever tested, but it doesn&apos;t have many notable weak spots, either. The performance isn&apos;t the best, but it&apos;s good enough. The design isn&apos;t cutting-edge, but it&apos;s modern enough. The cost is a bit steep at $3,300, but the sale prices look like relative values. As big, boxy refrigerators go, it&apos;s surprisingly well-rounded.